Dominic Lipinski / PA Wire/Press Association ImagesLabour Leader Jeremy Corbyn. Corbyn faces huge challenges from within the parliamentary party. Vote of no confidence set to occur this afternoon. Mass resignations from shadow cabinet, with more than 50 senior MPs leaving their positions in two days. Deputy leader Tom Watson allegedly asked Corbyn to step down. Reports of an incredibly stormy Parliamentary Labour Party (PLP) meeting on Monday. Two sources now suggest Corbyn voted to leave the EU, despite publically backing remain. Coup against Corbyn has apparently been in the planning for several months. Labour party leader Jeremy Corbyn faces a crucial day in his leadership as he prepares for a vote of no confidence from his parliamentary party later on Tuesday, as the UK’s most senior opposition politician faces increasing pressure from inside his own party to step down and allow someone else to take charge. Another frontbencher, Andy Slaughter, resigned earlier on Tuesday. In a letter, the shadow justice minister said he decided to step down after talking to his local party and other members in his constituency of Hammersmith. Mass resignations in the party forced Corbyn into a major shadow cabinet reshuffle. Corbyn has promoted several of his most loyal supporters into key shadow cabinet positions. Several were only elected as MPs for the first time at last year’s general election, and have no experience of being part of the shadow cabinet. He has also given senior positions to two of his most loyal supporters, Emily Thornberry and Diane Abbott. Despite the mass resignations of his most important staffers and the impending vote, Corbyn is standing firm in his refusal to leave the post of leader, and says that he will only stand down if a formal leadership challenge is made against him. Corbyn again reiterated that position at a rally in Parliament Square on Monday evening, when he told supporters that he will not step down as leader unless a formal challenge against him is made. “If there is another leadership election, Jeremy Corbyn will be standing again and I will be supporting him. This is not about any individual, this is about democracy of the movement,” shadow chancellor and key ally John McDonnell told the crowd in Westminster. Corbyn’s refusal to stand down led to an incredibly heated meeting of the Parliamentary Labour Party on Monday evening, with MPs reportedly exasperatedly pleading with Corbyn to step down. Many MPs, reports suggest, argued that Corbyn is fundamentally damaging the party. To add to the problems facing Corbyn, there is also an increasing belief among some wings of the Labour party, and several lobby journalists in Westminster, that Corbyn may have actually voted to leave the European Union, despite publically supporting the Remain campaign. 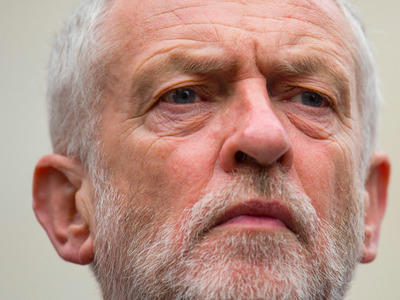 According to a report in the Guardian, a member of the public says that Corbyn told him that he planned to vote leave on June 10, while New Statesman political editor George Eaton tweeted on Monday night to say he is “now near-certain that Corbyn voted Leave.” Corbyn himself tweeted to say that he voted Remain, and there is no concrete evidence to suggest that this is not the case. While the wheels of an attempt at Corbyn’s leadership have just started moving, it appears that a coup against Corbyn has been in the offing for almost as long as he has been leader. In March, Business Insider reported that almost as soon as Corbyn was elected in September last year, certain senior Labour staff and MPs were already debating how long they should give Corbyn before challenging him. Timescales of between 12 and 18 months were banded around in the pubs outside the Queen Elizabeth II center where Corbyn was inaugurated. That now seems to have been an optimistically long time. 10 days before the EU referendum, the Telegraph reported that MPs were planning on using the referendum, whatever its outcome, as a way of knocking Corbyn off his perch as leader. “By fanning the flames with front bench resignations and public criticism they think the signatures needed to trigger a leadership race can be gathered within a day,” the Telegraph’s Ben Riley-Smith reported on June 13.